One only had to glance out the window to understand why the 18th floor of Mart Plaza hotel was the perfect venue for the Chicago addition of the Facades+ Conferences. 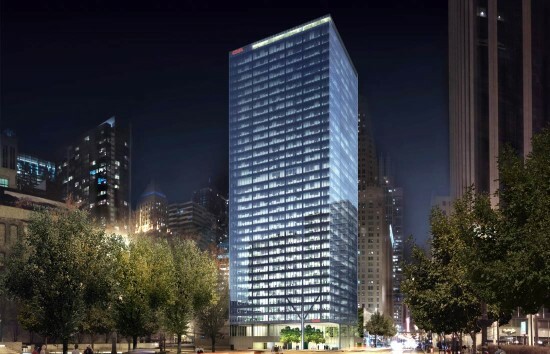 With views of 333 W. Wacker, the Willis Tower, and a handful of new towers under construction, the history of the modern facade was on display. The conversation in the symposium would be equally as rich with local and international speakers. The morning’s keynote address from Chris Wilkinson of London-based WilkinsonEyre, explored the latest in novel skin technologies from the fantastic flowing domes of Singapore’s Gardens by the Bay project, to the ship like Mary Rose Museum in Portsmouth, UK. The diverse range of projects presented by Wilkinson were shown along with insights into the process that lead their award winning solutions. In the case of the Mary Rose Museum, the recovered Mary Rose Ship is at the center of the design literally and ideologically. In particular, special care was taken to provide the precise environmental conditions needed to preserve the 420-year-old vessel. 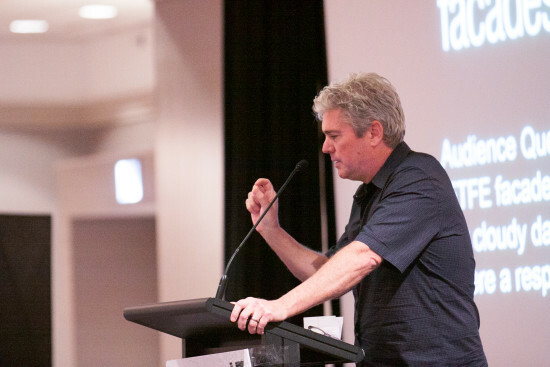 In his afternoon keynote address, Chicago’s John Ronan of John Ronan Architects discussed the political and social impact facades can have on a neighborhood. In the case of two of the public projects presented, brightly colored panel facades at once announce the project as a neighborhood institution, while providing a physical safety barrier in areas of the city where gun violence is too often a part of a high schooler’s life. Using a similar system of metal paneling for decidedly different reasons, Ronan described the iconic nature and tranquil interior provided in his Poetry Foundation building in downtown Chicago. 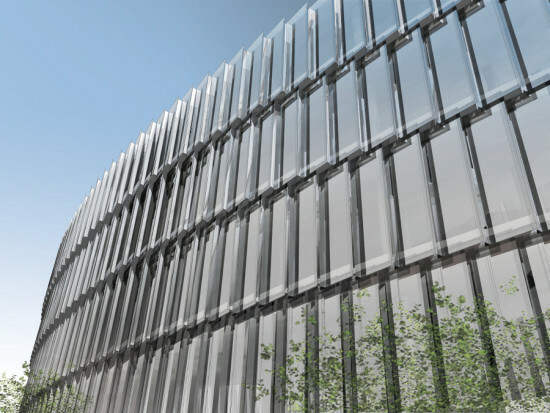 Ronan closed with a detailed look at the high-tech skin of the forthcoming Ed Kaplan Family Institute for Innovation and Tech Entrepreneurship at the Mies van der Rohe–designed Illinois Institute of Technology campus. The project’s inflated ETFE foil cushion skin regulates interior climate by controlling a moveable interior membrane with a variable air pressure system. 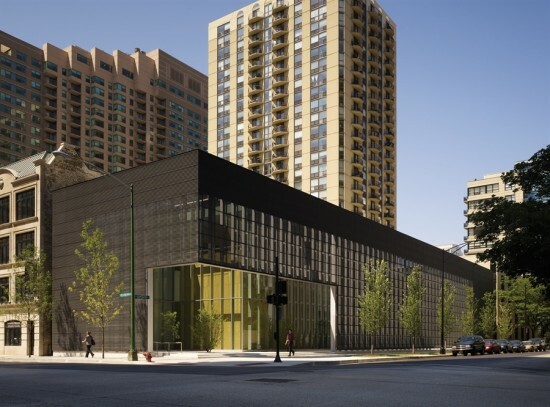 Other presentations included a discussion between 2015 AIA Chicago Gold Medal winner Carol Ross Barney, architecture critic Lee Bey, and Chicago Public Building Commission Executive Director Felicia Davis, on building in the public realm for the public good. Maged Guirguis of SOM and James Rose of the Institute for Smart Structures presented AMIE, the Additive Manufacturing/Integrated Energy project, a 3D printed house and vehicle pairing reimagining energy use. The day also included presentations from over 20 other experts in facade design, manufacturing, engineering, and the Methods + Materials gallery. Day two of the symposium included workshops and presentations from leaders in the global facade dialog, including representatives from Buro Happold, SOM, and Autodesk. The workshops provided for a hands-on, one-on-one, chance to discuss and explore the latest in facade technologies and design practices. Enrique Norten of TEN Arquitectos and Eric Owen Moss will give keynote addresses at the next Facades+ event on January 28th–29th in Los Angeles. In recent years, building envelope assemblies have become increasingly sophisticated, separating the skin from its traditional, structural function and thus making way for formal experimentation. But this freedom "presents a bewildering challenge," says John Ronan, founding principal of Chicago-based John Ronan Architects. "What do you do when you can do anything? When the surface of the building asks for no more than a cladding? I think architects are struggling with this question, and that is why one sees so many arbitrary formal tropes in facade design now; anything is possible, but nothing has meaning." Ronan, who also teaches at the Illinois Institute of Technology (IIT) College of Architecture, will share some of his own experience designing dynamic facades during the afternoon keynote address at November's Facades+ Chicago conference. For Ronan, a successful facade design begins with project-specific issues that go beyond environmental performance and client, to include program, identity, social factors, and historical context. As an example, he contrasted his firm's treatment of the Poetry Foundation and Gary Comer Youth Center buildings. 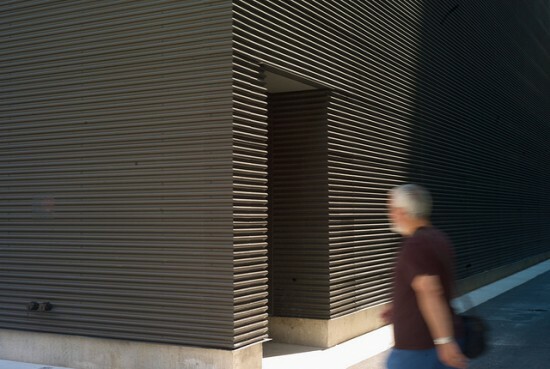 "At the Comer center, security and safety were primary issues due to violence in the neighborhood, and that influenced the facade design, while at the Poetry Foundation the issue was more one of public interface and creating a sense of intrigue or mystery, to entice someone to come in and explore," explained Ronan. The IIT Innovation Center presents a third point of reference. "[That facade] is driven by context, that is, the Mies [van der Rohe] campus, but also by technology—the idea that an institute of technology should have something very forward looking and innovative." Regarding the particularities of designing and fabricating facades for his hometown, observed Ronan, "Chicago is still a place where things are made, so we have a deep pool of material and fabrication knowhow to draw upon, and to a certain extent, the world still comes to Chicago for high rise design, a market which is typically on the leading edge of facade technology." On the flip side, architects and builders must contend with the Windy City's alternately hot, wet, and freezing weather. "Sadly, we have to leave buildings out in the rain, and this often dictates which materials and assemblies can and cannot be used Chicago," said Ronan, tongue in cheek. More seriously, he continued, "The development of rain screen facades has been liberating for us here, because it allows us to enclose the building and then come back in the spring to install the facade." Catch up with Ronan and other AEC industry leaders November 5–6 at Facades+ Chicago. Register today or learn more at the Facades+ Chicago website.